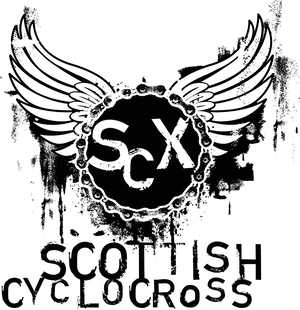 The Scottish Cyclocross season has begun. And begun with a bang. The first race of the season was hosted at the Meadowmill sports centre, Tranent, just east of Edinburgh. The event was sponsored and superbly put together by The Tri Centre (who are also putting up a Cyclocross bike as a prize this year – check out the SCX web site for details). What a course they laid on for the riders. Fast, sweeping, flowing corners interspersed with challenging climbs and techie single track meant for a superb circuit. Surprisingly for Scottish cross the course was almost dry and offered very little in the way of muddy, deep muddy or even wet muddy sections – but the season is yet young. A total of 173 riders filled the car park, which was brimming with anticipation and nerves – this was going to be one of the biggest SCX races ever seen! With a slight break in the Scottish drizzle a shard of sunlight illuminated the start of the first race. Youths’ Race An exciting race was put on by the youths. As they headed out around the tough course Tom Arnstein (Velo Ecosse) led out the race for the first four laps, but an unfortunate crash deprived him of his lead position giving the Wilcox brothers (Stuart and Ross from i-Cycles) a chance to take control. Stuart pulled out a 12 second lead on his brother and maintained the gap to take an early season victory. Ross battled on, chasing his brother and defended his second position from Tom who had continued to race but couldn’t quite bridge the distance. The girls youth race was led from the start by Lucy Grant (Peebles CC / Alpine Bikes) – a British medal winner – who produced a commanding lead over second place Catherine Angus (Carnegie Cyclones), followed over the line by Wenna Hastings (Port Mor Wheelers). With a field of 77 starters the first corner down the affectionately named “escalator” (the only way was down) was the focal point for most of the cameras but the race got underway with no major events. In the Vets race Gary McCrae (Leslie Bike Shop) led from the start, pulling out a 15 second lead by the time he crossed the line for the first time. Franco Porco (Falkirk BC) and John McCaffrey (Leslie Bike Shop) followed behind in the second and third positions respectively, with Cliff Featherstone (MTS Cyclesport / Inkland) biting at the heels of Franco. The race was on. Alan Quinn (Glasgow United CC) had a slow start but started to surge through the top ten to show his presence in the leading riders. An epic battle between John, Franco, Cliff and Alan unfolded for second and wasn’t decided until the last lap. After a mistake and an off from Franco, John moved up to second, Cliff into third and Alan not far behind in fourth. Franco crossed the line in a valiant fifth position. In the women’s race Alexis Barnes (Team Icarus) lead from the start displaying her usual strong riding ability. Chasing her throughout was Maddie Robinson (Velo Club Moulin), followed by Hannah Ferguson (Glentress Riders). The women’s race remained consistent throughout as all the participants fought to maintain their placings in what was a strong field. A special mention also has to go to the “gaggle” of women who seemed to conduct their social meet of the year around the course. I am not too sure who you are – but I heard one rider complaining that he might have caught up in their knitting at one point! (I jest). The junior race had a spectacular entry of two. Charles Fletcher led over his rival Angus Roger from the start to take a well-deserved win. To finish first; first you have to finish – and enter in the first place! Lets hope this field increases as the season unfolds. Again the popularity of cross continues to rise with one of the biggest fields ever seen at SCX. A total of 73 riders lined up to pit their wits against the Meadowmill course. From the gun George Buchanan (Glasgow United CC) led into the first few corners but sadly his over exuberance faded and he dropped back down the rankings. Craig Hardie (Hardie Bikes) – current SCX champion - resumed his normal position at the front and was closely followed by the new boys in town - the MTS Sport riders. MTS, consisting of Stewart Wearmouth and Steven Ward, soon took the lead as Craig made a rare mistake. The small step up, ridden successful by all the youths, exposed the chink in the Hardie armour resulting in a small gash to his knee – which he would milk to its full effect later. Stewart steadily extended his lead on the rest of the field, with Steven following his team mate and Rob Friel in third. Unfortunately, an untimely puncture in the last two laps saw Rob Friel lose his third position and Craig move up from fourth. Craig emptied every last effort in his legs but could not close the gap on the leading two. 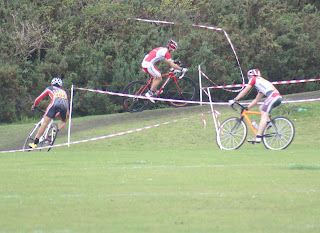 However, Hardie’s skills and bike control were a crowd pleaser; often the subject of the commentary. Davie Henderson and Paul Newman put on the battle of the race for fourth. The skirmish to the end of the race saw Davie take fourth and Paul fifth and even after his puncture Rob Friel “ran” home into a never more deserving sixth place. Stewart and Steven (team MTS), who had traveled up from Durham after looking at the weather to ride their first race in Scotland, praised the course and the organisation (by The Tri Centre). Stewart also spoke of how the race would prepare him well for the nationals trophy race next weekend in Wales where he was hoping for a podium place. Next weekend the SCX train heads to the central belt with a meeting at Plean. Why not dig out that bike and ditch those excuses to take part in probably the most fun you can have on a bike! Hopefully Scottish weather will remain as kind. See you see you all there! Cracking first reportage from the Turbitt's and I'm sure as the season goes on everyone will be fair game for a bit of banter :) You have been warned lol!